Sixteen people were killed when a train collided with a bus that had broken down at a level crossing near Moscow, Russia's investigative committee said in a statement. The incident occurred during the night near the city of Vladimir, about 110km east of the Russian capital. The bus, which was carrying migrant workers from Uzbekistan, was shunted several hundred metres down the track, Russia's Rossiya 24 TV channel reported. Footage showed fragments of what was left of the bus strewn across the track. The train itself appeared to have sustained no visible damage. "The bus stalled on the track," Vladimir Myagkov, a spokesman for Russian Railways, told Rossiya 24 at the crash site. "Some people say the passengers tried to push the bus off the track. At that moment the train approached and a collision occurred," he said. 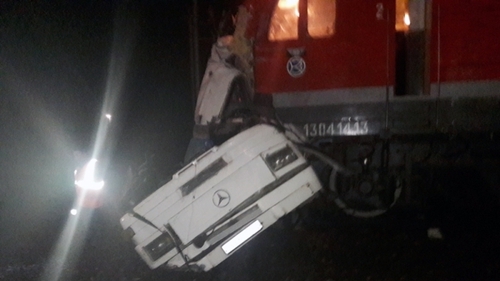 The train travelling from the western city of Saint Petersburg to Nijni-Novgorod, east of Moscow, collided with the bus at 3.29am local time. All of the dead were on board the bus. "There are no victims among the train passengers," the ministry said, and released pictures of the wreck of the bus near the railway track. The foreign ministry of neighbouring Kazakhstan said that the two bus drivers, one of whom was killed, were Kazakh nationals. Bus accidents are common in Russia. Seventeen people were killed in August when a bus carrying construction workers veered off a pier and plunged into the Black Sea.